Horn antennas cover a wide variety of applications, many of which require UWB operation. 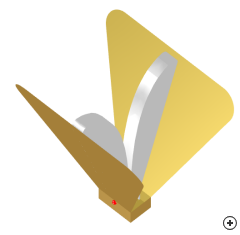 A common technique used to achieve UWB performance in horn antennas, involves the inclusion of a tapered ridge in the flare, which serves as an impedance transition between the waveguide feed and free space. A comparison of the radiation patterns of dual-ridged horn with and without side walls, showing the reduction in beam splitting at the higher frequencies for the design without side walls.